SPOTD: If anyone should try, it should be you. 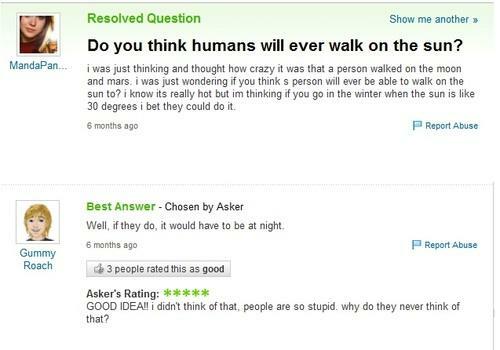 If anyone should try walking on the sun, it should be the person who suggested it, considering it takes a special level of stupidity to come up with the idea in the first place. This entry was posted on Monday, October 1st, 2012 at 9:52 pm	and is filed under Hilarity, Stoopid Person Of The Day, Stoopidity. You can follow any responses to this entry through the RSS 2.0 feed. You can skip to the end and leave a response. Pinging is currently not allowed.